Written August 5th, 2015 — Community Partners | Education. On July 31, dignitaries, community members, administrators and families came together celebrating a ribbon cutting for the opening of the Legacy Traditional School (LTS), which is a new K-8 campus on 12 acres in Marley Park. There are currently eight additional LTS campuses across Arizona, and each earned an “A” rating from the state Department of Education. As one of the key speakers at the ribbon cutting, Marley Park’s Executive Director, Todd Hornback, shared the vision of the community to over 1,000 in attendance. Groundbreaking for the charter school took place in January with its doors opening for the first day of school on August 4. The school totals 68,000 square feet and features 40 classrooms, with a capacity of 1,200 students. They reached their capacity for the 2015-2016 school year and currently have a wait list of 900 students. LTS brings an accelerated, back-to-basics curriculum. In addition to the core curriculum, students are offered a choice between two tracks of specialized education: Mozart Performing Arts Track, in which students receive four days each week of music instruction, and Athlos Fitness Track, where students receive four days each week of fitness, nutrition and wellness instruction. The school features a computer lab; media center; full-size gymnasium with wood floor; full-service commercial kitchen and cafeteria; athletic fields for baseball, soccer and football, plus outdoor basketball courts; and playgrounds separated according to grade level. 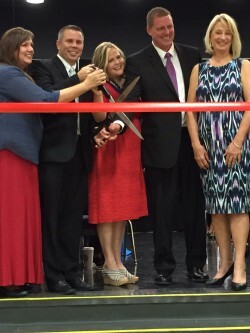 Welcome to the neighborhood, Legacy Traditional School!